It wasn’t on my list to pour resin when Michele called about a perfect butterfly in early October. I resisted, reasoning the Little Mosaic boxes I was working on took creative precedence. “This perfect butterfly won’t last,” she reasoned. A silversmith, Michele McMillan works beautiful, simple and thoroughly modern designs. Although I now refer to seizing the moment, once I saw the distinctive orange and black markings, this Monarch butterfly became an obsession. 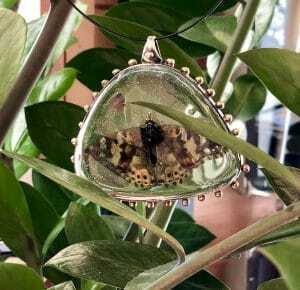 Would the resin burn the butterfly? 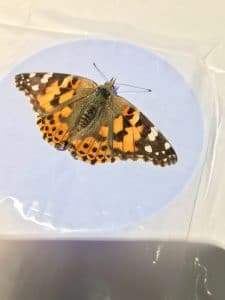 Would the butterfly discolor as resin flowed over it? How would I pour to accommodate the larger midsection (the body) of the butterfly? The butterfly itself was huge. What could I put it in that would accommodate the 2.5” width? Resin covered my butterfly. It was the first of many pours. Monarch Butterfly Lesson #2: Ask for help. Michele suggested a silver bezel with brass nailheads. She offered to help me make it, but I deferred to her expertise. We measured and fitted the butterfly to its bezel and phase two of the project began. My experience with open-backed bezels was practically non-existent, but my spirit was game. The engineering aspect of the project tripped me up. I’d not considered the bail and its level propensity. My resin overflowed everywhere. If you’ve ever scraped, snipped and filed to clean up resin, you know what I’m talking about. I had an enormous task. Every nailheads was soaked with resin. I had to get it off before it cured. Several hours later, I finished the project – or that portion of the project. After my cleanup experience, I worried so much about the over-runs that I forgot to even out the resin. The monarch had to be finished from both the front and the back. It seemed like an ongoing task on my workbench. For days the monarch was the first thing I looked at and the last thing I touched before leaving the studio. One surprising outcome: a new respect for silversmithing. Instead of resisting the work involved, I gave myself fully to it. The joy I gained from completing and finishing my Monarch was immense. I enrolled in a silversmithing class, determined to increase my knowledge and skill. In addition, I have great gratitude for Michele McMillan – for her friendship, her expertise and her work. Thanks Michele. I can also laugh at my learning curve. The Monarch Butterfly project resonated with new levels of creativity for me. There will be more natural objects, I’m certain. Look for more adventures on this blog.